I am happy to be here amongst your midst to deliver the Valedictory Address of the Eleventh Pravasi Bharatiya Divas. Today is an important day in the history of our country as this is the day when the father of our nation, Mahatma Gandhi, returned from South Africa 98 years ago. It is befitting that January 9 has been chosen as the Pravasi Bharatiya Divas for today is a sort of homecoming for the Pravasis, symbolic though it may be. It also gives the nation an occasion to renew and strengthen our bonds with the its diaspora, to celebrate and acknowledge the exemplary work done by you all in the various fields in your adopted country. It is appropriate that this event is also being held in Kerala as the state has signified in many ways how the diaspora can contribute to the welfare of the state with which they are so closely linked. Hundreds of thousands of workers and professionals from this state have migrated abroad, particularly to Gulf countries and their contribution to the welfare of the state has been remarkable. They have also played a significant role in advancing the cause of the society by making it a state that has some of the best indices in the human development index. Non Resident Keralites have been important agents in the State's promotion of sustainable development and socio-economic transformation. Their contribution to the state by way of investments and remittances has been unparalleled. According to a study published by the Centre for Development Studies, Thiruvunanthapuram, in 2011, approximately Rs. 49, 695 crore was remitted by emigrants from Kerala. The State Government too has embraced several steps to deal with the issues of the diaspora; important among them was the creation of a separate organization, called Non Resident Keralites' Affairs Department, in the state in 1996. The Indian diaspora has made our nation proud through the significant contributions that they have made to the development of the nations which they have chosen to make their homes. It is a matter of pride for every Indian that today there are atleast 5 Heads of States or Heads of Governments and over 70 senior political leaders such as Deputy Heads of State, Speakers and Ministers in various countries who can trace their roots to India. Ladies and Gentlemen, His Excellency Shri Rajkeswur Purryag, the President of Mauritius is one such eminent personality. He epitomizes the spirit of leadership and public service that the people of Indian origin have so famously exhibited. 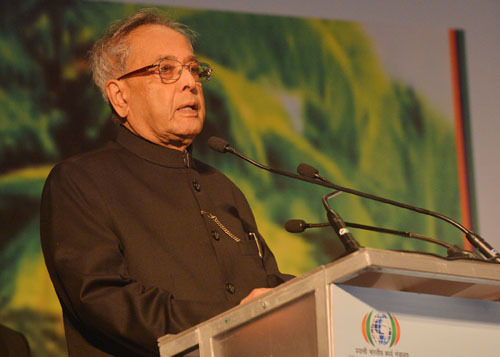 We are delighted and grateful that he is here with us today as a shining symbol of the Indian diaspora in the world and as the representative of the two-thirds of the people of Mauritius who are of Indian origin and Mauritius. India's has a deep and enduring relationship with Mauritius. India-Mauritius relations continue to grow on the bedrock of the historical and cultural links between the diaspora and India. It is of particular delight that 12th March that is celebrated as the National Day of Mauritius is also the day that marked the beginning of the Dandi March of Mahatma Gandhi. Mahatma Gandhi had too made a brief stopover in Mauritius in 1901 on his journey from South Africa to India. Ladies and Gentlemen, The Indian diaspora has today grown to an estimated 25 million in as many as 110 nations. It is a story of many geographies and many histories. The vast and diverse overseas Indian community grew for a variety of reasons attributable mainly to mercantilism, colonialism and globalization. The divergent patterns of settlement, the varying degrees of integration with their new homelands and the emergence of new identities and ethos make the Indian Diaspora unique in many respects. It epitomises a saga of trials, tribulations and the eventual triumph of the will and hard work. There is virtually no field of human endeavour that does not have your imprint. The Indian diaspora is present in significant numbers in Canada, Malaysia, Singapore, Mauritius, South Africa, the USA, the UK, the Gulf nations and the countries in the West Indies. I am told that in Bahrain, every established business organization in that country has an Indian employee in senior or middle management position. Some of the brightest minds from the Indian diaspora have also been able to make their mark in the field of high technology. Late Dr. Har Gobind Khorana was awarded the Nobel Prize for medicine in 1968. Late Dr. S. Chandrasekhar, was awarded the Nobel Prize for Physics in 1983, has the premier X-ray observatory of NASA named after him and the latest addition to the list is Dr. Venkataraman Ramakrishnan who won the 2009 Nobel Prize in Chemistry. While we celebrate the accomplishments of the diaspora, we should also not forget that many of them are struggling to establish themselves and many are facing hardships. Some of them are working as labourers and domestic helps. Many of them face difficulties on account of stringent labour laws, difficult working conditions, non-receipt of salaries, premature termination of contracts, change of contractual obligations amongst others. Our missions abroad have been working hard to solve many of these problems. The diaspora can also lend a helping hand in this regard. They too could share information with the various organizations under the Ministry of Overseas Indian Affairs on the change in laws and conditions of employment and help those in need in times of crisis such as bereavements, etc. I have been informed that diaspora organizations specially in the Gulf countries do provide such services. Strengthening of such social service and philanthropic organizations may be something that the affluent sections of the diaspora could seriously look at. Ladies and Gentlemen, I would also take this opportunity to remind you that India is today a land of immense opportunities. It is the third largest economy in the world on the basis of Purchasing Power Parity. It too is the second fastest growing economy after China. In six out of the last nine years, our country has managed to grow at a rate above 8 per cent. Due to the slowdown in the global economy and other factors, the growth rates have declined, from 8.4 per cent in 2010-11 to 6.5 per cent in 2011-12, and further to 5.4 per cent in the first half of 2012-13. However, as India's economy has demonstrated its ability to weather external shocks in the past, I am hopeful that this resilient character of the economy will help to reverse this short-term deceleration and bring economic growth back to the level of 8 to 9 per cent. You too can become partners in the progress of the nation. For the accelerated growth of the economy, the investment level has to increase. As you all know, the rapid economic growth in India after 2003-04 was accompanied by a rise in the investment rate, which has declined after reaching its highest level in 2007-08. Thus, a revival of the high investment rate in the country is a must for the economy to regain its 8 per cent plus growth levels. You all could help in the process by investing in Indian companies and establishing new ventures. The yield of Indian equity markets is amongst the highest in the world and many of the most famous companies have established business here or seeking to do so. As the Finance Minister, I had opened the Indian capital market for Qualified Foreign Investors (QFIs). Initially, we permitted QFIs to invest in Indian Mutual Funds and on 1st January 2012, in a far-reaching decision, we opened the doors for them to directly invest in Indian equities. Soon thereafter, the Corporate Bond market was opened to QFIs. You may, therefore, also like to look at the opportunity that India offers in this regard and take advantage of the high yield that you are likely to get by investing in the Indian capital markets. India has also set up a friendly regime to enable Indians abroad to remit money to the country. NRIs can deposit money in the country under the Non Resident External Rupee account scheme, Non Resident Ordinary Rupee account scheme and Foreign Currency Non Resident account Banks scheme. These schemes have been welcomed by the diaspora that they had deposited close to US$ 67 billion at the end of October 2012. The net private transfers from abroad during the first half of 2012-13 was close to US$ 33 billion. These figures bear testimony to the fact that Indians abroad find it both emotionally and financially fulfilling to invest in India especially in view of the sound economic fundamentals of the country. The theme of this year's Pravasi Bharatiya Divas, "Engaging Diaspora: The Indian Growth Story" should explore ways and means to encourage further participation by the diaspora to give additional impetus to India's growth story. I also wish to see the Indian diaspora as a stronger partner, not only in India's economic growth, but also in building India's knowledge society, while continuing to engage culturally and emotionally, and serving as the effective ambassadors that they have been for this country. I am happy to note that we have created institutions that enable India to interact with its diaspora more comprehensively. Since 2006, the Union Ministry of Overseas Indian Affairs has set up institutions like the Overseas Investment Facilitation Centre for enhancing economic engagement with the diaspora, and the India Development Foundation of overseas Indians to channel the philanthropic impulses of overseas Indians. The Know India and Scholarship Programmes have been introduced to provide overseas youth of Indian origin exposure to the country's culture, heritage and economic growth. Overseas Citizenship of India (OCI) and Persons of Indian Origin (PIO) cards have been introduced to facilitate easy travel to India. These are only some of the important measures introduced to strengthen the bonds with overseas Indians. There is an important role that each one of you can play in India's journey to becoming a strong, just and equitable society and taking its rightful place in the comity of nations. I am sure that the various seminars and sessions that you have attended over the last three days would prove useful in many ways. Besides giving you more information on the opportunities that India offers you, they would have also given you an insight into the several initiatives that have been taken to ensure social development and inclusive growth in the country. With the knowledge and experience you have gained as academics, scholars, scientists, technologists, professionals and businessmen, you can play a decisive role in the development of India. I have no doubt that together we will keep our 'tryst with destiny'. I wish you success in all your endeavours and join in celebrating and acknowledging that we are proud of your achievements and the invaluable service that you have rendered India, the nation of your roots.